306 pages; 2007. Genre : Fiction. Awards : #1 New York Times Bestseller. Overall Rating : C.
Rick Dockery is a bench-warming 3rd-string quarterback on the Cleveland Browns, until Fate and injuries-to-others deal him a disastrous performance in a playoff game. He is figuratively run out of town, and ends up playing the next season for the Parma Panthers in an Italian Football League. There he learns some of life's lessons about loyalty, friendship, and dedication, and also gains an appreciation for the culture of a foreign country. It's an easy, pleasant read. It screams to be made into one of those Sunday night Hallmark Special made-for-TV movies. It's got a smidgen of romance for female readers, and lots of football for male readers. Although the book has a logical climax (the league's Super Bowl), Grisham leaves a number of important loose ends dangling. I presume this is deliberate, and that we'll be seeing a sequel to this in a year or two. 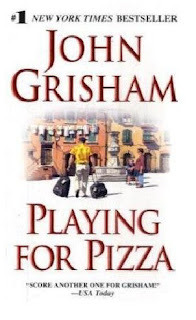 Reading this book, I couldn't help but think that Grisham wanted to vacation in Italy, and decided to charge it to the publishers as "research". His descriptions of Italian churches, countryside, and cities all sound like they were taken from a tourbook. If you're a Grisham fan (and I'm not), you'll probably find P4P a disappointment. There are no legal themes, no complexities, and no deviations from a predictable plot. It is safe to say this made it to #1 on the NYT bestselling list by virtue of the author's name. Nevertheless, this is a decent book if you're looking for some "Hallmark movie" relaxation, so we'll give it a "C". But you can be sure that the next book I read will have killing and mayhem in it. I saw this book and debated on picking it up or not. I'm kind of glad I didn't. I'm not a fan of "Hallmark" movies, they're too sentimental and emotional. I did really like Skipping Christmas (the book and the movie) and am not too big on legal thrillers, although The Rainmaker with Matt Damon was good. I was hoping Grisham's non-legal thrillers would be good as SC. I guess I'll have to wait. If you're not a Grisham fan, why did you choose this book? Just an interesting premise? I myself have never read Grisham, and have no desire to do so. i picked up P4P cuz it was 30% off at Target. i've yet to figure out that, if Borders and/or Target are selling some big-name author's paperback book at 30% off, it's probably a dud. Grisham's too technical for me. that's also why i don't like Tom Clancy. but Christina is right - movies of Grisham's books are usually good. For that reason - the not knowing if best sellers are actually good - I generally read things from the library, first. That way, there's no mistakes. I love my library.